The Asus GTX580 has been revealed – bringing the latest DirectX Nvidia graphics technology. With Nvidia's GTX 580 finally making their official arrival on Monday, the manufacturers have reacted by rolling out their latest cards. 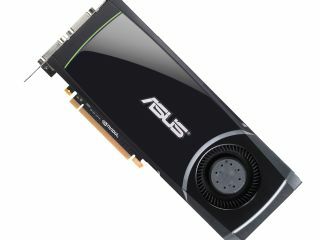 Asus' GTX580 brings support for Full HD Nvidia 3D Vision Surround gaming – it can support three screens and is factory overclocked at 782MHz with 512 CUDA cores. That, Asus insists, means that this is the most powerful graphics card available with the Nvidia technology. "It features a large 1536MB GDDR5 video memory, rated at over 4GHz," adds Asus. "The massive 384-bit memory interface opens up performance by removing data transmission bottlenecks for better hardware utilisation." Asus has also added in its popular proprietary Voltage Tweak tech which gives users a "quick and accessible way to overvolt the graphics card to its limit at 1157MHz".